“Alaska Airlines Flight 543 was being pushed back from the gate about 7:45 p.m. and its wingtip clipped another aircraft,” Alaska said in statement. 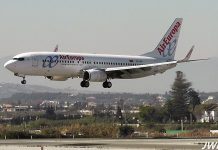 The airline confirmed there were no injuries and said the 182 passengers on board the plane were able to depart at 9:45 p.m. local time on a different aircraft. United Airlines confirmed the incident, saying in a statement that the Alaska Airlines plane “made contact with UA199” as the flight from New Jersey was “taxing to the gate at a low speed.” The United passengers were allowed to deplane per normal at the gate following the incident, and United engineers were inspecting the aircraft.